There was a time when gallbladder and cholecystectomy issues were the most common medical malpractice cases that we saw. In recent years, complications of gastric bypass surgery may have become even more common in medical malpractice. The rise of the number of these cases being litigated is probably due to a number of factors and is open to debate, so I won't go into that nest of hornets. But I have seen a common need for a general orientation to the anatomy and surgical techniques involved, so that is the topic of this piece. First, lets cover the purpose of gastric bypass. For those obese patients who find it impossible to lose weight through traditional diet and exercise programs, gastric bypass surgery can be effective. This surgery involves a dramatic reduction in the size of the stomach reducing the amount of food that can be consumed in any one meal and therefore imposing caloric intake restrictions on the patient after surgery. To understand the surgery, you must first understand the basics of the anatomy involved. Food that is swallowed flows down through a muscular tube called the esophagus that extends from the throat down through the posterior chest, behind the heart, and into the upper abdomen where it empties into the stomach. After being substantially broken down by the gastric juices, the bolus of food then leaves the stomach and moves into the small intestine, another muscular tube that leads to the colon. It is also important to know that bile from the liver and pancreatic juices from the pancreas, which both affect digestion, also empty into the first segment of the small intestine just past the stomach. 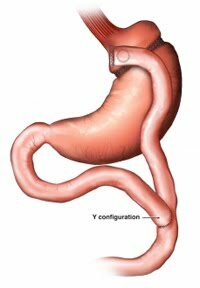 In a gastric bypass the stomach is divided so that only a small portion of the upper part of the stomach is left attached to the esophagus. Although food can still get into this small pouch through the esophagus, it cannot get out, so a way must be devised to allow the food to exit. To accomplish this, the small intestine is divided a few feet below the stomach and the distal (furthest away) segment is pulled up and attached to the bottom of the stomach pouch. This connection of the small intestine to the newly created stomach pouch reestablishes the flow through the digestive system, but what of the gastric juices in the lower part of the stomach and the bile and pancreatic juices that enter into the proximal small intestine? They still need a route to escape and join with the digestive contents. 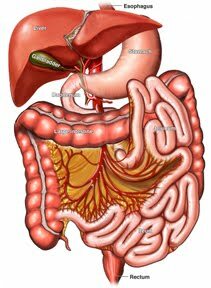 Therefore the small segment of the small intestine above the loop that has been pulled up to the stomach is attached to the side of this loop so that the digestive juices in the proximal segment can join with the flow well below the stomach. When you look at this new architecture of the small bowel, it appears to form a Y, thus the name "Roux-en-Y". Finally, let's look at the language a bit more closely. Most laymen are put off by the excessively medical sounding title "Roux-en-Y anastomosis". Don't let the name scare you. First, what is an anastomosis? It's simple. Just know that an anastomosis is a connection between two tubular structures. This could be a connection between two blood vessels, two bile ducts or in this case, two segments of bowel. So what about Roux-en-Y? Don't let the name of the famous Swiss surgeon throw you off. A Roux-en-Y anastomosis is any connection of any two segments of bowel in a Y-shaped pattern, so the "Y" part of the name is what is important for you to remember. So long as you understand that this procedure involves a transection of the bowel, connection of the distal segment to the stomach and connection of the proximal segment of the bowel lower down on the distal segment, it will be clear to you. See the animation at the top of the article and you will see that this is a rather straightforward concept.